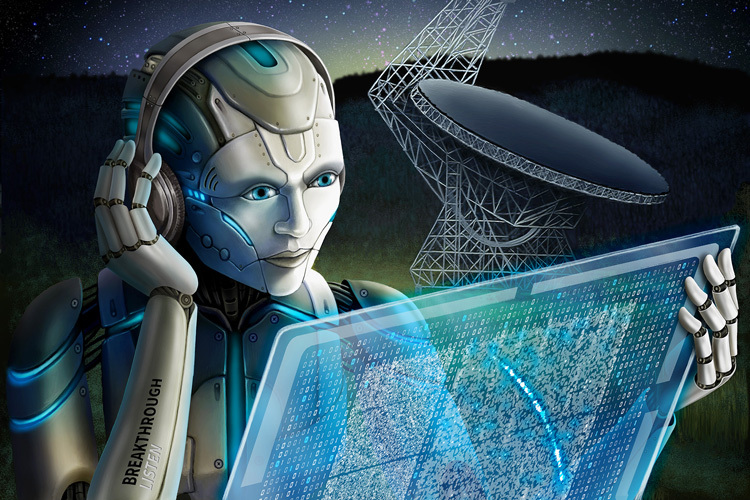 Researchers at Breakthrough Listen, a multimillion-dollar campaign to seek out signals from alien civilizations, still don’t know exactly what’s causing repeated bursts of radio waves from an distant galaxy — but thanks to artificial intelligence, they’re keeping closer tabs on the source, whatever it turns out to be. A team led by Gerry Zhang, a graduate student at the University of California at Berkeley, developed a new type of machine-learning algorithm to comb through data collected a year ago during an observing campaign that used the Green Bank Telescope in West Virginia. The campaign focused on a radio source known as FRB 121102, located in a dwarf galaxy sitting 3 billion light-years away in the constellation Auriga. Astronomers have observed plenty of fast radio bursts over the past decade, each lasting only a few milliseconds. Only FRB 121102 has been found to send out repeated bursts, however. A number of theories have been proposed to explain the bursts, ranging from interactions involving magnetized neutron stars and black holes to deliberate signaling by advanced civilizations. This entry was posted in GeekWire and tagged Breakthrough Initiatives, Fast radio bursts, SETI, Space. Bookmark the permalink.